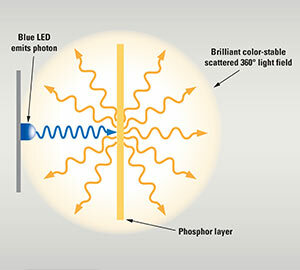 Let's take a look at the way white light is typically created with LED technology. All standard LEDs emit a single wavelength of light. Through the evolution of the semiconductor, the lighting industry was first able to engineer the red LED, followed by orange and yellow, green and finally blue in the 1990s. White light is created by using high-energy blue LEDs with rare-earth phosphor blends that down-convert the blue energy into white light in desired Kelvin temperatures (CCT). The traditional method of implementing the interaction between the LED energy source and the phosphor materials is to apply the phosphor blend directly to the light-emitting surface of the LED. In critical lighting applications, this method can create problems in terms of consistency and long-term color stability. A very small amount of phosphor material is used for each LED, which can cause unit-to-unit inaccuracies in both CCT and red/green balance. Also, the high junction temperatures reached at the LED junction can cause cheaper, less stable phosphor materials to degrade over time, particularly with phosphors that generate the longer wavelengths, i.e. red light. In order to build more accurate, color-stable light sources for photography, a few high-quality manufacturers employ Remote Phosphor Technology (RPT). RPT fixtures rely on a separate phosphor substrate: a phosphor-coated polycarbonate panel separated and in front of the blue LED light. These panels emit high-quality, extremely predictable light when excited by the high frequency wavelengths of blue LEDs. By applying the phosphor blend over the larger surface of the panel, the overall consistency and accuracy of the emanating white light is far superior to the results realized by application of the phosphor directly on the LED. RPT is the first LED technology to achieve a Color Rendering Index (CRI) score of 98, imperceptible to the quality of actual sunlight (CRI 100). Also, by distancing the phosphors from the LEDs, any potential color shift caused by heat from the LED is virtually eliminated. Beyond the technical specs, employment of RPT technology provides a unique artistic advantage. The complex blend of high-quality phosphors found in RPT fixtures makes for much more natural-looking, nuanced images. Careful blending of advanced phosphors, including deep-red chemistry that extends the color rendering range into the near-infrared spectrum allows RPT fixtures to achieve a broad range of natural, healthy skin tones on-camera. With RPT, the surface of the substrate becomes the light source, meaning that no diffusion is required to blend the output of the individual LEDs. The surface emanates light equally over the entire surface at a typical spread of 160 degrees in all directions, creating a very soft lighting source, perfect for lighting both people and broad areas. The ultimate value of Remote Phosphor Technology, employed in many Cineo Lighting products, is that it delivers an abundant amount of evenly distributed light with the highest quality color rendering achievable from LED technology, with longer fixture life.